324 pages | 53 Color Illus. | 40 B/W Illus. The self-organization of bionanostructures into well-defined functional machineries found in nature has been a priceless source of ideas for researchers. The molecules of life, proteins, DNA, RNA, etc., as well as the structures and forms that these molecules assume serve as rich sources of ideas for scientists or engineers who are interested in developing bio-inspired materials for innovations in biomedical fields. In nature, molecular self-assembly is a process by which complex three-dimensional structures with well-defined functions are constructed, starting from simple building blocks such as proteins and peptides. This book introduces readers to the theory and mechanisms of peptide self-assembly processes. The authors present the more common peptide self-assembled building blocks and discuss how researchers from different fields can apply self-assembling principles to bionanotechnology applications. The advantages and challenges are mentioned together with examples that reflect the state of the art of the use of self-assembled peptide building blocks in nanotechnology. "A very timely contribution that brings together state-of-the-art research in the emerging field of peptide self-assembly. 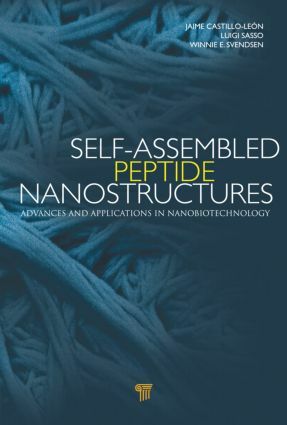 This volume is highly recommended for researchers interested in both theoretical aspects of how peptides self-assemble and the burgeoning number of applications that are appearing for these fascinating structures." "This book presents both an introduction to and updated review of peptide-based nano-assemblies, ranging from a detailed description of the molecular forces governing self-assembly to applications in bionanotechnology and medicine, with an especially interesting chapter on how to manipulate self-assembled nanostructures for integration into devices. It is a complete yet succinct overview of the current research into the subject and its applications." Jaime Castillo-León graduated from the Industrial University of Santander (Bucaramanga, Colombia) with a BSc in chemistry. He received his doctorate in 2005 from the Department of Biotechnology at Lund University. His thesis involved the fabrication of electrochemical biosensors for the detection of compounds of biomedical importance using cellular models. Currently, he is assistant professor in the Department of Micro and Nanotechnology, DTU Nanotech at the Technical University of Denmark. His research focuses on micro- and nanotechnologies for the development of biosensing devices for biomedical applications. A strong focus is in the manipulation, characterization, and integration of biological nanotubes and nanofibers with micro- and nanostructures for the development of bioelectronic sensing devices and drug delivery systems. Luigi Sasso graduated from the University of Illinois at Chicago with a BSc (Honors) in chemical engineering. He received an international master’s degree in physics and nanotechnology from the Technical University of Denmark in 2009. Currently, he is pursuing his doctorate at the Nano-Bio Integrated Systems group (NaBIS), while working with surface modifications of nanoelectrodes for cellular measurements. His research involves the use of new biosensor materials, with a focus on self-assembled peptide nanostructures. Winnie Edith Svendsen received her master’s degree in physics from University College Dublin, Ireland, in 1993, where she received the EOLAS applied research award for excellent research. She obtained her PhD from Copenhagen University and RISØ in 1996. She then accepted a postdoctoral position at the Max Planck Institute for Plasma Physics, Germany. In 1998, Dr Svendsen received a talent stipend from SNF (now FNU) and the prestigious Curie stipend from Copenhagen University to establish a research group to design a hyperpolarized gas setup for use in medical lung diagnostics. In connection with this project, she received funding from the European 5th framework to organize a workshop on hyperpolarized gases. In 1999, she was appointed associate professor at Copenhagen University. Since 2000, Dr Svendsen has been associate professor at DTU. In 2006 she established her own research group, NaBIS.